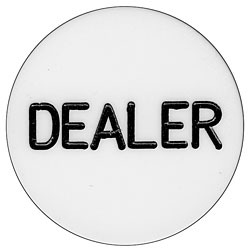 This 2 inch Diameter, solid White Acrylic dealer button has the word dealer engraved on both sides and highlighted in black. The thickness of the button is about 1/4 inch thick. This is the same type of dealer button used in Casinos and perfect for your home game or event.